Hopa Casino: 100 Free Spins + £200 Bonus on first deposit! If you like playing slots and love getting free spins, you might want to check out this deal from Hopa Casino. There are 100 Bonus Spins and £200 in Bonuses waiting for every new player! Find out everything worth knowing about Hopa Casino in our full casino round-up below. Hopa Casino is a smart and intuitive casino from Aspire Global. If you don’t know these guys, they were the team behind Karamba Casino. Hopa is a little different and has a much simpler and unassuming design but make no mistake these guys have plenty to offer you! Hopa Casino allows the games to be the main attraction and with their dark colour scheme, the games really pop out! The first thing you’ll notice is the scrolling promotions and popular slots on offer! With games from industry big hitters like Microgaming, NetEnt, Amaya and NYX Interactive, casino fans are going to be spoiled for choice! The casino is easy to use and operates instantly via any browser. As long as you have an internet connection you can enjoy Hopa’s games. Just register and start playing. 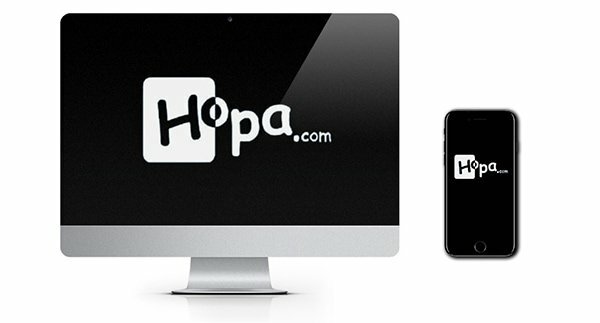 Hopa is compatible with mobiles and tablets including Apple iPhone, iPad, Windows and other Android devices. Keen to learn all there is to know about Hopa’s games? You’ll be pretty thrilled to learn that they feature over 200 titles. The games have been compiled from the collections of NetEnt, Microgaming, NeoGames, Amaya and NYX Interactive. This means the quality and graphics are going to be second to none. A quick tour of their games library reveals so many top games there are too many to list! So here are just a handful of our favourites: Gonzo’s Quest, Immortal Romance, Electric Sam, Avalon, Thunderstruck II, Foxin’ Wins, Grim Muerto and Guns ‘N Roses. Not a bad little line-up! Casino games include a number of blackjack, roulette and baccarat titles with several versions of each game, so it’s unlikely you’ll get bored here! There are poker games too including Joker Poker and Jacks or Better. It’s not the biggest collection of table games you’ll find, but most the major boxes are ticked. Plus there are a few live games if you want a truly authentic casino experience! New players can collect a $200 deposit match bonus and 100 Free Spins when they register and deposit into their new casino account. Upon registering, just deposit £10 or more to receive a 100% match bonus worth up to £200 and 20 Bonus Spins! Deposit on day two and get a further 40 Bonus Spins. Finally, when you deposit on day three, you’ll get another 40 Bonus Spins! Hopa Casino is all about making their players’ lives easier. This includes offering over a dozen payment methods so you can choose the one that works for you. Accepted methods include Visa, MasterCard, Neteller, Skrill, Paysafe Card, EntroPay, Payr, iDEAL, Sofort, GiroPay, ClickandBuy, InstaDebit, EcoCard, Euteller, Trustly and Zimpler. British Pounds, Euros, US Dollars, Canadian Dollars, Australian Dollars, Brazilian Reals, Denmark Kroner, Norwegian Kroner, Swedish Kronor. Hopa Casino is operated by Aspire Global Limited. They are licensed and regulated by the Malta Gaming Authority and the UK Gambling Commission. The customer is king at Hopa Casino, and their helpful support staff are on hand seven days a week should you run into any issues. You can get in touch instantly via their live chat service. You’ll find a quick link at the top of the casino screen. You can also email them with your query or give them a call. They are available daily from 8 am until 1 am (GMT). PICK UP YOUR FREE SPINS AND BONUS CASH NOW! Follow our handy link, and we’ll send you straight over to Hopa Casino where you can collect your new player bonus! Hopa Casino has the perfect blend of slots from all our favourite software developers, check them out today!